The PIC® 337 is selected for efficient growth and feed conversion reducing the number of days to slaughter.This sireline will give you the greatest potential for economic return in your system. • Superior lean carcass growth. • Greatest total carcass value. • Maximum production of quality pork. The PIC® 337 is a terminal sireline selected for feed efficient growth, reducing days to slaughter while delivering maximum carcass value in high quality pork, making it the ideal sireline for production of heavy slaughter weight pigs. Scale– Investment in increasing the size of the Genetic Nucleus base populations will increase further selection intensity producing elite GGP boars of high index for AI Stations globally. More than 250,000 pigs are tested each year in the Genetic Nucleus and GN Crossbred programmes. Genomic tools– PIC has taken advantage of the latest advances in genomic technology to accelerate dramatically traditional rates of genetic improvement (>100,000 pigs genotyped per year). Investment in new genetic tools such as Relationship Based Genomic Selection (RBGS) has delivered a 35% boost over traditional rates of genetic improvement, results never before seen in the industry, a pig produced in the last year creates £3.00 more value for the producer than a pig produced the year before. • Robustness and survivability from birth to slaughter. • Lean efficiency. • Carcass value. PIC®359 has quickly become one of our most popular boars as it delivers total profitability in all environments. This line is the best choice for producers who want predictable and robust lean growth and balanced total profitability from weaning through market. ￼• Excellent Feed Conversion at Heavy Weights. • Excellent Lean Gain Efficiency. 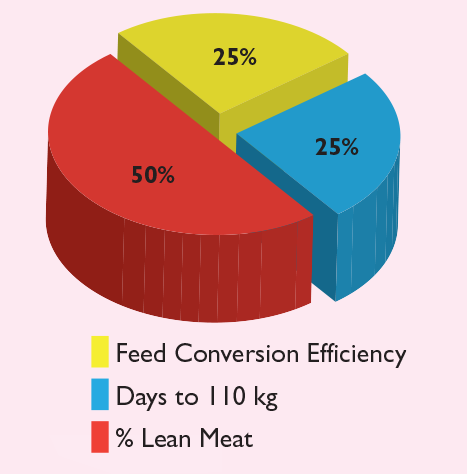 • Excellent Feed Conversion Efficiency. • High Kill Out % & Carcass Yields. • Maximum Hybrid Vigour & Disease Resistance. The Hylean MAXGRO™Terminal Line is specifically designed to maximize lean growth, and Feed Conversion in the progeny.The progeny of the Hylean Maxgro are renowned for their vigour and viability.The Hylean Maxgro is ideal for the production of heavy weight slaughter pigs, with excellent growth and carcass yields. The Hermitage Hylean Maxgro TLI 2 are boars specifically selected from within the overall Maxgro population for customers who are targeting high slaughter weights with low backfat measurements.The Hermitage Hylean Maxgro TLI 2 is a boar which is selected with a greater emphasis on backfat (P2 of under 8mm @ 110 kgs). Hermitage now has one of the largest high health terminal boar nuclei with over 1,200 GGP sows producing the Hylean Maxgro boars for Hermitage AI Stations worldwide. For producers that want more emphasis on lean meat percentage, the use of Hylean Maxgro TLI 2 is recommended. TLI selection criteria is specifically focused on optimising Lean Meat % and carcass quality while maintaining progress in FCR and growth rate. • Fast and Efficient Growth. • Robust & Durable. The duroc to produce high quality meat with excellent growth at low cost. The PIC® 280 is the best Duroc choice for producers looking to get excellent meat quality, high growth and cost efficiency. 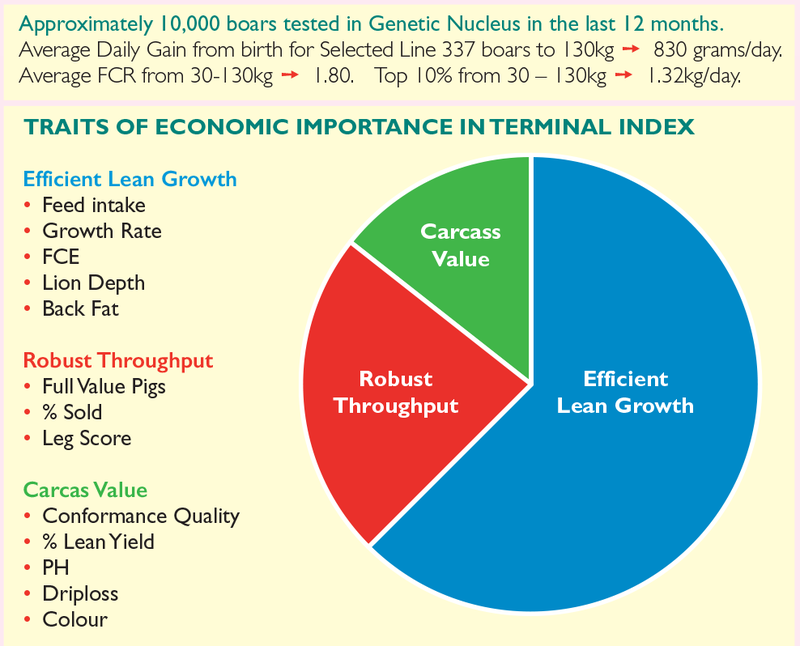 Easy to manage combination of growth, efficiency, and meat quality with more full value pigs. Approximately 10,000 boars tested in Genetic Nucleus in the last 12 months. Average Daily Gain from birth for Selected Line 280 boars to 130kg ➙ 790 grams/day. Average FCR from 30-130kg ➙ 1.99. Top 10% from 30 – 130kg ➙ 1.26kg/day. • High Lean Tissue Growth. • High Kill Out % and Carcass Yields. • Halothane Negative. • Robust, Hardy & Durable. The PIC-Hermitage Top Drawer Duroc is a robust, high conformation purebred terminal sire and is suited to both indoor and outdoor production systems. Progeny of the Top Drawer Duroc are renowned for excellent eating quality and carcass yields.TheTop Drawer Duroc is ideal for crossing with PIC-Hermitage Hybrid gilts. All PIC-Hermitage Terminal AI boars are individually performance tested and included in the PIC-Hermitage Terminal Sire BLUP analysis, generating a unique Terminal Line Index (T.L.I) for each boar. PIC®327 is our best-selling lean production sire due to its high lean percentage, robust livability and lower production costs. This line is the best choice for producers who want predictable and robust performance as well as exceptional efficiency and leanness at heavy weights. • Excellent Lean Gain at Heavy Weights. • More Full-value Pigs Marketed. • Low Backfat at Heavy Slaughter Weights. Approximately 10,000 boars tested in Genetic Nucleus in the last 12 months. Average Daily Gain from birth for Selected Line 327 boars to 130kg ➙ 790 grams/day. Average FCR from 30-130kg ➙ 1.91. Top 10% from 30 – 130kg ➙ 1.24kg/day. • Robust, superior piglet viability. • Optimum lean growth and primal yield. • High kill out % and carcass yields. Maximize your herds performance using Hermitage Genetics High performing, robust Hampshire genes. Specifically selected for Growth, ADG, FCE and lean meat yields. Optimum heterosis and excellent meat quality.